Ninja Block is a Kick Starter funded home automation start-up that makes DIY home automation a little bit easier. The solution is a free software platform that allows home automation enthusiasts to develop solutions that allow them to manage home connected devices from the web and mobiles. With it, you can create rules to manage you lighting, security and response to the home environment. Like other home automation solution the Ninja Block does not offer anything new but what sit it apart from the other is, you can get your coding hands dirty. It is for you to do what you which and how you want to do it, just let your imagination be your guide. Ninja Block is supplied with a number of sensors for windows and door, temperature and humidity and motion. You can tell it what to do when the temperature changes, if someone is at your front door and if you think your security has been breached. You can integrate the Ninja Block with the Philiphs Hue, Limitless LED and Belkin WeMo Switch to create the perfect ambiance for your bedroom or living room. 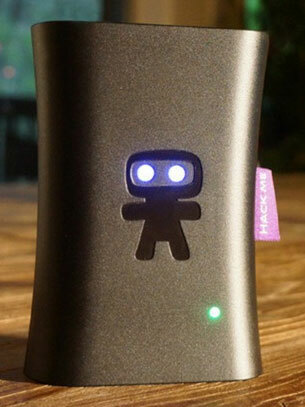 The Ninja Block website also offers other connected devices that you and manage with the Ninja.